There aren’t as many ospreys around here as there should be. They should be everywhere but they almost went extinct in the 1970s and their population has yet to recover. Turns out, the wonder pesticide DDT, introduced to mass agriculture right after WWII, was not so wonderful for ospreys, pelicans, and bald eagles. Ospreys, eagles, and pelicans weren’t eating crops treated with DDT but the raptors ate rodents that ate those crops. More importantly, all of them ate the fish that swam in waters rich with pesticide runoff. Runoff was the overlooked variable in the pesticide equation. And there was a lot of it, since DDT accumulated in the estuaries, and rivers, and oceans. DDT stayed in the tissues and the organs of the birds and caused their eggshells to form paper-thin. Thin eggshells shattered when a mother sat on her nest. Not being able to bring chicks to term was a pretty solid way to eliminate a species or three in a jiffy. Tricky Dicky, President Nixon – who once personified evil but compared to Reagan, well, he didn’t seem so bad – signed the Endangered Species Act in the early 70s after Congress banned the use of DDT, effective though it was. The problem was given the name “bio-magnification,” the unknown before now – but honestly, if you thought about it, not surprising cumulative side-effect of long-term exposure to something foreign, something indigestible and unknown before saturation in our 20th century inventions. Even in seagulls, a species impervious to the eggshell thinning problem, high concentrations of DDT started showing up in male seagulls whose sexual organs didn’t develop, male birds that started exhibiting feminine behavior. It was as if DDT made the seagulls gay. Juvenile jokes aside, bio-magnification started to impact seagull reproduction, too. 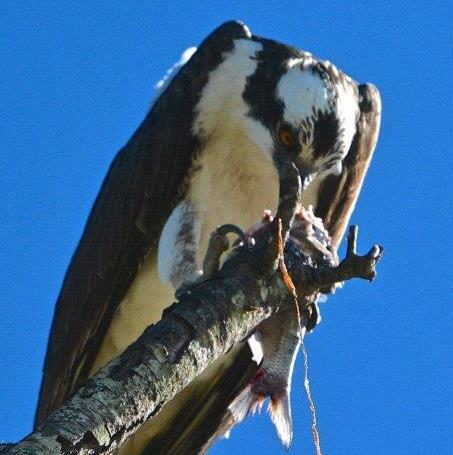 Thirty years later, the ospreys are thriving. Their sharp happy caws constantly staccato along the shore and their nests of twigs and pieces of palmetto fronds top telephone poles, lightening struck trees, and anywhere else they can highjack. There’s nothing quite like watching one cruise the surface of the Gulf of Mexico, talons extended, before snatching an unsuspecting fish for the last wild ride of its life.